서 있는 모습의 석가모니불을 중심으로 여러 존상을 화면 가득 그린 영산회괘불탱과 괘불을 보관하는 궤이다. 괘불탱은 본존불을 화면의 절반을 차지할 정도로 크게 그리고 그 양옆에는 문수보살과 보현보살을 배치하였다. 화면 상단에는 관음보살과 세지보살, 2구의 타방불이 자리하였다. 본존불은 오른쪽 어깨를 드러낸 옷을 입고 있는데, 오른손은 다소곳이 모아서 길게 내려뜨리고 왼손은 가슴께로 들어 올려 손바닥을 위로 한 채 엄지와 가운데 손가락·넷째 손가락을 살짝 구부리고 있다. 장대한 신체와 더불어 움츠린 듯 직각을 이루는 넓은 어깨에 네모난 얼굴과 어깨에 닿을 만큼 길다란 귀를 갖추고, 두터운 옷을 입은 듯 표현되어 한층 중후함을 느끼게 한다. 둥그스름해진 사각형의 얼굴에 눈썹은 약간 쳐지고 입은 작게 묘사되었으며, 눈썹과 콧수염ㆍ 턱수염을 녹색으로 굵게 그리고, 입술은 선홍색으로 표현하고 있다. 본존을 향하여 몸을 살짝 틀고 있는 문수와 보현보살은 연꽃 위에 서서 화려한 보관을 쓰고 두손으로 여의(如意)와 연꽃가지를 받쳐들고 있는 모습이다. 입고 있는 옷의 색채와 무늬, 손모양만 서로 다를 뿐 신체 및 발 등 자세는 거의 똑같다. 어깨 위로 길게 늘어진 머리카락과 여러 장식, 머리묶음 띠, 가슴장식, 팔찌, 귀고리 등도 매우 비슷하다. 이 그림에서의 가장 큰 특징은 빈틈없이 꽉 채워져 있는 여러 문양들과 각 인물마다 표기되어 있는 붉은색 범자(梵字)이다. 문양은 연꽃무늬, 덩굴무늬, 구름무늬와 둥근무늬, 잔꽃무늬, 점무늬인데, 그 중에서도 덩굴꽃무늬와 연꽃무늬, 구름무늬는 삼존의 주된 문양으로서 화면 전체에 걸쳐 화려함을 더해주고 있다. 범자는 각 인물의 이마 위 중앙과 두 눈썹 위, 눈꺼풀, 중간계주와 정상계주 및 육계 정상 또는 보관 하단과 정상, 목 윗부분 중앙과 가슴 위ㆍ아래, 그리고 발목 부분에 씌어져 있다. 이 괘불탱은 조선 영조 6년(1730)에 승려화가 의겸 등에 의해 그려졌다. 신체비례가 적당한 인물의 형태와 이목구비의 표현, 조화롭고 밝은 색채의 사용, 세련된 필치의 화려하고 정교하고 다양한 문양, 주된 인물을 중앙에 크게 그린 다음 기타 인물을 뒤로 물러나게 배치하는 구도법 등은 의겸의 특징적인 표현수법으로서, 진주 청곡사영산회괘불탱(국보 제302호)과 비교해 보아도 손색이 없다. 괘불을 보관하는 궤는 뚜껑 윗부분 일부가 결손된 것 외에는 보존상태가 양호한 편이다. 괘불탱 조성 1년 뒤인 조선 영조 7년(1731)에 만들어진 이 궤는 '만·왕·십자(卍·王·十字) 및 범자(梵字)' 무늬가 투각되어 있는 궤 부착의 정교하고 다양한 형태의 금속장식 또한 보기 드문 예로 당시의 금속공예 연구에 귀중한 예라 할 수 있다. The piece contains images of a standing Shakyamuni Buddha (at the center) and others at Vulture Peak, Gijjhakuta Hill for preaching the Lotus Sutra, along with the chest used to store the piece. The figures fill up the canvas. The image of Shakyamuni Buddha occupies about half of the canvas. Manjusri Bodhisattva and Samantadhadra Bodhisattva stand beside the Buddha. 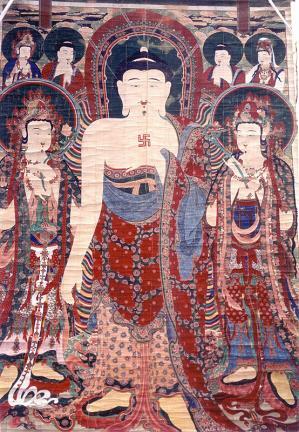 At the top of the canvas are Avalokitesvara, Mahasthamaprapta Bodhisattva, and two other Buddhas. The robe worn by the main Buddha is hung only on the left shoulder. His right hand gently hangs low, with the left hand held up to the chest, palm facing upward (gesture of subjugating demons). His robust body, broad shoulders, square face, and long ears almost touching the shoulders give an impression of dignity. The eyebrows, moustache, and beard are depicted thickly in green, with the mouth done in scarlet. Manjusri Bodhisattva and Samantadhadra Bodhisattva turn their body slightly in the direction of the main Buddha. They stand on a lotus flower, wear a gorgeous-looking crown, and hold a magic bead and a lotus flower in each hand. The colors and patterns of their robe and the shape of the hands are different from each other, but the shapes of their overall body and feet look the same. They also show similarity in terms of the hair flowing down to the shoulders, ornaments on the robe, hairband, chest ornament, bracelet, and earrings. The most conspicuous things in this painting are diverse patterns and Brahmi letters, marked in each figure. Patterns include those looking like lotus flowers, scrolling vines, clouds, circles, small flowers, and dots. Floral vine, lotus flower, and cloud patterns in particular are the main patterns used for a triad, adding to the gorgeous atmosphere. Brahimi letters are marked on the following locations: center of the forehead, right above the eyelashes, at the top of usnisa (a protuberance symbolizing supreme wisdom), top and bottom of the crown, upper center of the neck, upper/lower chest, and wrinkles. This hanging painting was painted by monk painters, including Uigyeom, in 1730 (the 6th year of King Yeongjo’s reign). The appearance of well-proportioned bodies of figures, expression of neat facial features, use of well-harmonized, bright colors, refined brush strokes, gorgeous and exquisite patterns, and portrayal of the hero in a large size at the center were Uigyeom’s signature techniques. This one is in no way inferior to its cousin (National Treasure No. 302) in Cheonggoksa Temple, Jinju. The storage chest used to keep the hanging painting is in good condition. Made a year later than the painting, the chest contains the Chinese characters “卍,” “王,” “十,” and “梵” – which are all associated with Buddhism -- made with the bratticing technique. Exquisite metal accessories in diverse shapes attached to the chest are rare ones and are consequently precious materials for those studying metal handicrafts of that time.